I am a wife, a mom of 3 children, and a follower of Jesus Christ. 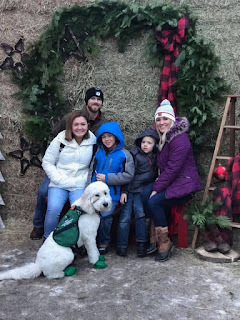 While my life is filled with many adventures, this blog is only about my family's journey through autism. I hope that it can be an encouragement to other special needs parents. Do you ever wonder why Easter is so important? What does it say about God? How does it affect us? How should it change us? A lot of people know it is the observation of Jesus’ death on the cross, but don’t really know why that’s so important. I blog about Jesus and His salvation, how HE alone gets me through this life with hope and joy, so I wanted to share with you about how you can have that same hope and joy and salvation. The Bible says that God is the creator of all things. He is holy, that means he is perfect. He has never sinned and will never sin. However, the Bible says that man is sinful and in need of forgiveness from our rebellion against God. The Bible says that the punishment for our sin is death; separation from God here on earth and for all eternity. Because God is holy and just, our sin literally cuts us off from Him. But God loves us so much that he didn’t leave us here in our depravity. He gave us a way to reconcile our relationship with Him. He gave us a way to be made holy in His eyes. He sent His only son, Jesus, to come and live a perfect life, die on the cross to pay the punishment for our sin (past, present, and future) and conquer death by rising from the dead on the third day. If you believe this and confess Jesus is Lord of your life, you will have salvation. You can be made right with God and have a personal relationship with God. Confess your sin, repent and make Jesus the boss of your life and you can have salvation! 9 because, if you confess with your mouth that Jesus is Lord and believe in your heart that God raised him from the dead, you will be saved.10 For with the heart one believes and is justified, and with the mouth one confesses and is saved. For me, the severity of my sin was enormous. The depths of hurt and pain from sin was so profound and my rebellion from the Lord seemed too far for forgiveness. However, Jesus’ sacrifice on the cross was so much bigger. God, in His perfection, created a way for our forgiveness and reconciliation to Him. Because He is perfect, I trust His perfect plan for my life, no matter what that means. Because of His sovereignty over all things, I have hope that life is bigger than me and that the future is filled with HIS magnificent glory. That joy supersedes circumstances. In fact, the forgiveness that I have received, though I never deserved, is so sweet and so wonderful it changed my heart. The Lord literally gave me a new heart. I urge you to seek the Lord. Cry out to God and ask for forgiveness. Confess and turn from your sin and ask for Jesus to be your Lord. I pray for your salvation. I know many of you are hurting. Struggling through constant trials, seeing your children suffering, and being a full-time caretaker is hard. Life can be incredibly hard. While becoming a Christian doesn’t promise you a life of ease, it does promise you a life of purpose, hope, and joy despite those burdens. I know personally that in my sin, I was completely desperate and lost. I was searching for joy, but everything fell short. Surrendering my life to the Lord and serving the Lord brought me peace and more joy than I could’ve imagined. My struggles and fears pale in comparison to God’s power and peace. I sat there in my bible study group a few weeks ago wondering if I should ask for prayer again..for the same old prayer request I've had for 7 years now. I wondered if I needed to bring up one of the many current dilemmas we are experiencing from autism to feel like I had a valid reason for asking for that same prayer again and again. I wondered if I should even ask for prayer again at all. And then at another meeting the thought crossed my mind, "Should I bring this up again?" But there I was with everyone looking at me waiting to hear my prayer request and I couldn't help but to burst out in tears. It's tiring to be a full time caretaker. Its tiring to worry about safety all the time. It's tiring to worry about education and speech and doctors appointments and anxiety all the time. And it's tiring to feel like I shouldn't ask for that same prayer again and again. BUT I need prayer. I need the same prayer over and over. Prayer to remain faithful in the hard times, to continue leaning on God and focusing on God, prayer for endurance and long-suffering, prayer for Jacob to continue growing and learning, prayer for my marriage and my kids, and prayer through the really challenging times. In past studies, I have learned that the purpose of prayer is primarily to learn more about God. It's also our way to honor and praise Him, to make requests or supplications, our way to hear from Him and so much more. So I wonder why I keep feeling like I'm such a burden or nag to keep asking. It made me wonder if other people feel the same. Do you struggle with asking for the same prayer request again and again? Do you also feel awkward when people ask how the situation is going, knowing that it hasn't gotten better and sometimes its worse? I know for me its hard to be real and say that things are still a struggle at times. I think people find it uncomfortable to know that things aren't getting any better. They want a response that things are improving when, at best, things are the same. But the truth is, while my situation isn't getting any easier, my walk with the Lord absolutely can become more intimate, my joy in the Lord can become stronger, and I NEED to know more about God. I need to know more about His sovereignty, especially when going through life long challenges. To give God glory throughout the trials in a genuine way, I have to know and trust who God is. That only comes through prayer and study. We need to seek his face and ask others to help us seek Him and know Him more. So I want to encourage you, when you feel like you can't possibly ask for the same prayer again, to ask anyways. People that love us will want to know that our situation is still demanding, tiring, and difficult. People that love us and love God know that we need Him more than anything else...more than health, comfort, etc. So I did it. At the meeting, I asked again for that same prayer and I cried (too much). As they prayed over me, I thanked the Lord for the encouragement. I pray for encouragement for moms feeling this same way. I pray you find the courage to ask for "that" prayer request again and again, knowing that you NEED to know God more. We Got to Thank Taylor Swift in Person! This past weekend was pretty epic! Taylor Swift invited us to her concert and backstage to meet her. We were so excited to get to thank her for Reid in person. Reid has changed Jacob's life and our family life so so much. I don't think that she will ever truly know how much Reid has impacted Jacob. 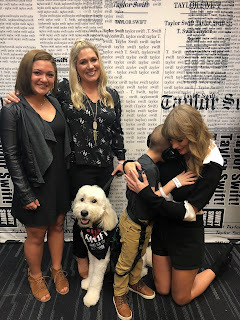 All week long at the clinic the therapists worked on showing Jacob pictures of Taylor and teaching him to say "Hi Taylor" as well as showing him videos and making social stories of what it would be like at her concert with the flashing lights and sounds. I was more than concerned about how he would handle the concert and waiting in lines, etc. I went to Party City and bought a bazillion little toys, the clinic printed out pictures of Randall's (the grocery store that he is currently obsessed with) and I had tons of candy all in my purse to use in case of meltdowns. We ended up needing every single last thing I brought, but it worked! We got to go backstage before the concert. 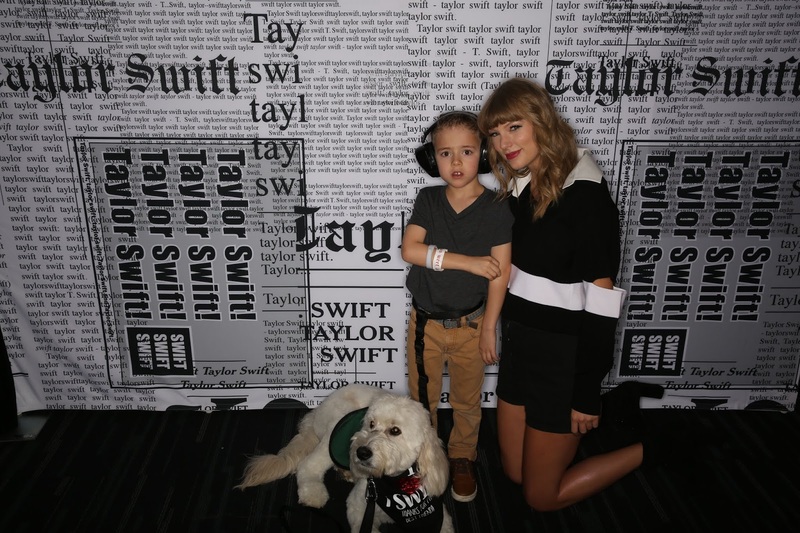 When we walked in, Taylor made a sweet comment about Reid being a fluffball and actually didn't try to pet him to my surprise. His vest has a Do Not Pet sign on it (which I wish I would have removed for her), but I found it so refreshing that she didn't assume she should be allowed to pet him. I TOTALLY would have made an exception for her, but loved that she was so respectful of that. Talk about a celebrity that gets it! Next, she got on her knees and looked Jacob right in the eyes and thanked HIM for coming to her concert even though she knew it was loud and there was so much going on. I was so thankful she tried to connect with him instead of talking over him to me. She saw the boy, not the disability. Nothing makes me happier than when people chat directly to Jacob. After that, Jacob grabbed her face and pushed her hair back and said loud and clear "Hi Taylor!" and without batting an eyelash she said "Hi". She didn't act upset about his extreme lack of personal space. Her sweet smile just says it all. After their picture, the flash scared him really badly so he snuggled up with her for our group picture. Taylor hugged Jordan and I and then even offered for people to take a picture with their cell phones so there wouldn't be another flash. We were given strict instructions to move quickly and only take one picture, but once she saw that he was having difficulties she told her bodyguards that it was ok and to take more pics. These are the two they downloaded for me. Cell phones weren't allowed, probably because people would go nuts in there. She was just kind and understanding. It was very cool. The tickets they gave us for the concert were right up front. Jacob made it through most of the concert and loved it. He danced to "Shake It Off" and enjoyed the giant drums on stage. Jordan missed her Homecoming to go, so she wore the dress we bought her with a jacket and had the time of her life. She was so happy to thank Taylor and meet her and get to experience such a cool night. It was awesome to be able to thank Taylor in person and tell her how much her gift/Reid means to us. She is such a super autism advocate. I thank God for these blessings and experiences and cannot wait to see how the Lord uses Reid to help Jacob even more. We are a few weeks in now and I must say that life with Reid has gotten A LOT easier. Walking with Reid has become pretty normal. Its much simpler than wrestling with Jacob. We have seen Reid protect Jacob while crossing streets and he even saved Jacob from a car the other day. We were headed out of Costco and the wind started blowing. Anyone that knows Jacob, knows that the wind is his mortal enemy. He flung his arms all around and took off running behind us towards moving cars. I made Reid stop, which stopped Jacob in his tracks before getting in front of the car. It was a pretty cool moment. Actually, every moment with Reid has been pretty cool. The biggest thing is that Jacob is walking by himself! He has independence and he is so proud. 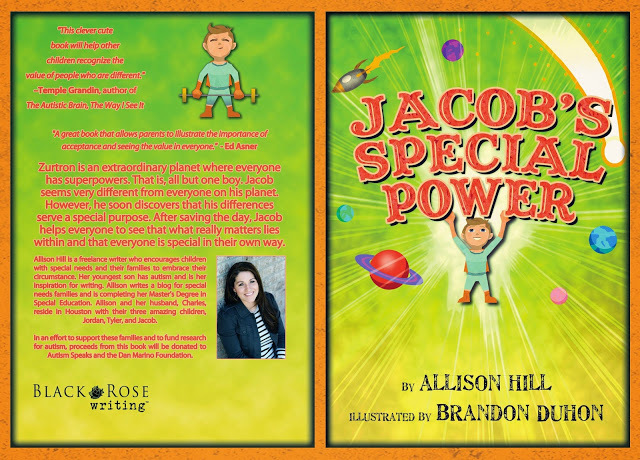 Jacob’s therapists say that they have never seen Jacob happy like he is now. I am so grateful. I had to remind myself to just breath and take it all in and relax. The crisis of a new dog and new rules and new schedule was over. Funny how right when one thing ends another begins, right? I’m sure you ASD moms get it. 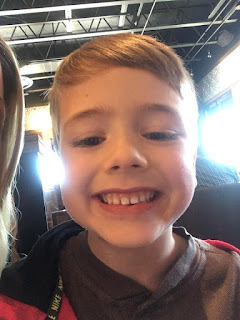 Last week we took Jacob to another BCBA to get an evaluation for an academic program (because he is really behind) only to hear that he isn’t ready for all the academics because his language comprehension isn’t age appropriate. Unfortunately, the clinic he attends only goes up so far and doesn’t work on the high functioning language and reading comprehension issues due to insurance. That leaves us paying out of pocket for a really incredible, but really expensive BCBA. Sometimes I wish for things to just be easy for a bit…for there to be a time without crisis or struggle… But right when I needed it, I heard from God. In a time of crisis God reminds us to honor him as holy and to fear and dread him. What an interesting thing to do in a time of crisis. I can’t count the times that I have tried to blame someone or something or mostly myself or my past sin for Jacob’s autism. Guilt and anger can creep up in my heart and steal my joy and test my faith. As my pastor suggested, it is usually because I get scared and I want to find some order in the chaos of it all. But God is sovereign over all things. I recognized that every time I start to question ‘why’ or those thoughts of blame and conspiracy creep in, I need to study God’s word and to be reminded who he is and that he is in control of everything that happens. Jacob’s autism was not a surprise to God. The struggles our family faces are not a surprise to God. The opposite is true, nothing happens without God’s consent. That truth alone gives me comfort. As a believer, I know that God wants good for me. His good may not look like my good, but I am so thankful for even that. His plan and purpose aren’t limited to my understanding or desires or definition of good and that gives me hope. God, in his infinite sovereignty and goodness and justice and love, allowed Jacob to have autism. He has a plan for our lives and that plan is obviously bigger than mine. His authority can be trusted. Because of that truth I have joy despite the times of real struggle in our lives. God is holy. If I’m being honest, what haven’t I feared when it comes to Jacob? I have feared for his safety, his health, his happiness, his learning, what people think of him, what people think of me, am I sharing too much, is the sharing helping, do people think I am an idiot (probably)…I have dreaded the future for him, I dreaded the future for my marriage (will we always be caregivers, will we get vacations alone, etc. )…the list goes on and on. Usually I try to nip that fear and dread right away. Although those fears are usually fleeting and I try not to let the fear influence my behavior, I am certainly not perfect. It is hard not to fear men. Its hard not to fear a lot of things and its hard not to dread the future sometimes. But, God says we should only fear and dread him. I loved that my pastor explained the freedom and confidence you can have when you no longer fear the world, but only fear God. He said that God will replace fear and dread with hope and peace. We fear God because he is holy and perfect and just and we want to be holy imitators of him, not slaves to the world. When we fear the things of God, all the things of the world are put in to perspective. We dread the future without a saving faith in Jesus because we are separated from God in this life and the afterlife because of our sin. God is so holy and sin cannot be in his presence. Therefore, we cannot be in his presence because we are sinners. But God sent his son Jesus to live a blameless life and die on the cross to pay our punishment for sin. That price was paid in full on the cross and when Jesus died and rose from the grave he conquered sin and death once and for all. If you believe this and surrender your life to Jesus, God forgives all your sin past present and future and you can be in right relationship with him. We fear/ dread God because he is the creator of all the universe to which we owe all. When you have Jesus as your foundation, nothing, no crisis, no diagnosis, nothing will shake you. Your fear is replaced with true hope because God is bigger than your crisis. God is big enough to get me through any crisis that comes up and he is big enough to do the same for you. Trust in the Lord “ And he will become a sanctuary and a stone of offense” for you in your time of struggle. God doesn’t promise that you will be crisis-free as a believer, but he walk with you through anything and he will give you comfort and true hope. If you need prayer or if you want to know more about becoming a Christian please email me at allisonhill4jesus@yahoo.com and I would love to talk about it with you and pray for you. Reid is here...and it's NOT what I expected. What a whirlwind the last week has been! I traveled to Portland, Oregon to get Jacob’s service dog and in just one week all of my expectations and plans have shifted. I can’t really explain what I expected from the dog…possibly that the dog would just magically change our lives and make everything ok…maybe just an added security…I don’t know. I do know that by day 1 of training, I realized that having a service dog was not going to be what I expected. On day 1 of training I learned a lot. I learned that our service dog is a third-party service dog. This means that I am the main handler of the dog and the dog and I work as a team to assist Jacob. There will never be a time that the dog is tethered to Jacob alone. This is because Jacob does not have the ability to care for and command the dog on his own. If he ever gets to be the dog’s handler, it won’t be for years and years. So basically, I have a service dog. I learned that I would be communicating with Reid through his leash and series of hand movements as well as verbal commands. I also learned that Reid would bond with me even more than Jacob. Many people have emailed me asking things like ‘how will the dog know what to do?’ or ‘how will the dog know that Jacob is his boy’. Well, in the beginning he won’t. What he knows is to obey the person handling him and the commands given to him. So, if Jacob tries to run I will command the dog to stop and then Jacob can’t run. If Jacob has anxiety, the dog may sense it in me and come to me, but I will guide the dog over to Jacob. Eventually, by being tethered to Jacob everyday he will learn a lot about Jacob. As we walk through stores or parks or anywhere, I have many many rules to follow. I have to pay constant attention to the dog so that I can redirect his attention to me. I hold the leash in a particular way and move it in certain ways to direct him where to go and what to do. I give him treats when he obeys, I don’t allow anyone to touch him or get his attention, I do training with him twice a week. There were lots of details I had to learn and be critiqued on throughout the week during training. The trainers said that as I get used to handling him it will become second nature. I will feel the dog pull on the leash and gently command him back to heel. I will notice other dogs in the area and know to get Reid’s attention and keep it on me to redirect him. Basically, on day one of training I realized that I knew nothing about service dogs and that I had no idea about all the work that would go into having this dog. I’d be lying if I told you that I wasn’t feeling a bit panicked there. I cried a lot. I totally fell in love with Reid, but I already have a full plate…how was I going to add on to my responsibilities with a very high maintenance dog? But by the final day of training, even though I was still processing this new job that I had, I realized that my plan was totally bogus compared to God’s plan for our family. Although Reid will be a lot of work for me, I learned so much about how he will help Jacob in ways I hadn’t thought of and didn’t realize we needed. Although it won’t be easy, our lives and particularly Jacob’s life will be better, and he will have so much more freedom. I wanted a dog simply to tether to Jacob and to anchor to the ground when he tries to run. After all, that is the scariest thing that he does. That is not how this dog will help Jacob. They told me that for clarity and the public they say the dog is a physical anchor (and yes Jacob can’t run off tethered to the dog), but we will no longer refer to the dog in that way. There are autism anchor dogs, but ASDA doesn’t believe in having a service dog to only prevent Jacob’s maladaptive behavior. The reasoning is genius. Jacob is supposed to bond with Reid. When Jacob runs and I command Reid to stop, I am also telling Jacob to stop and that he cannot run off. Jacob associates me with the no. I then tell Jacob to slow down and grab Reid’s handle and then allow him to gain access to what he wants if it is appropriate. That is teaching him self-control, impulse control, and to calm down, rather than teaching him that he has a big dog that is preventing him from getting what he wants. That would possibly make the dog a negative thing for him and we want Jacob to love and be loved by Reid. The dog also provides emotional comfort and support. In just one day I have seen the dog curl up with Jacob in his bed and Jacob fell asleep in 10 minutes rather than his hour long of chanting before sleep. I don’t know if that will be the norm, but I can see that Reid has a calming effect on Jacob. Service dogs are research proven to lower blood pressure, and we have seen at the doctor’s office that Jacob’s blood pressure increases when he is under stress. Jacob will have jobs to do to care for the dog. In addition, because I have so many behavioral techniques that I am using with the dog, it just naturally will make me use some of those with Jacob. Simple things that I should do with him, but don’t always find the time to do such as walking slowly, praising good behavior, correcting negative behavior, self-control in all environments instead of just rushing through to get through it. So far, day 1 and 2 with Jacob and Reid have been amazing. Jacob took to Reid almost instantly. He hugs all over him and loves on him. He gets a huge smile on his face each time he walks in the room. It absolutely melts my heart. Reid did great in church and all has gone smoothly. This week Reid will be with me everywhere I go. On Friday, a trainer from Portland will fly in for the week and train Cret to be the secondary handler and then we will begin tethering Jacob to the pup. I am so excited to see how that goes! It's all very new and exciting. So throughout this new adventure I have seen that in God’s loving kindness, He has given me more work. He's given me a new hard job and I am truly thankful for this challenge and blessing because I can see it is what's best for Jacob and for our family. I am grateful because God knew exactly how Jacob needed help and in ways that I didn’t even know. It made me realize how puny my mind is and how big my God is. Although an anchor dog would have been ok for Jacob, an autism service dog from this company is so much better. Through the use of this incredible animal Jacob will start learning and exhibiting behavior that is more appropriate and helpful for his well-being. We can begin going places together as a family and an added bonus is that Reid may just reduce some of my anxiety that comes along with being a caregiver to a child with special needs. It amazes me to think of the ways Reid will bless our family. It amazes me even more that God loves and has provided for Jacob again in such a tremendous way. I appreciate all of the love and support and kindness so many people have shown us. It is so encouraging to know that people are rooting us on and so excited about Reid joining our family. I can’t wait to share all about Jacob and Reid’s journey. God is so good. 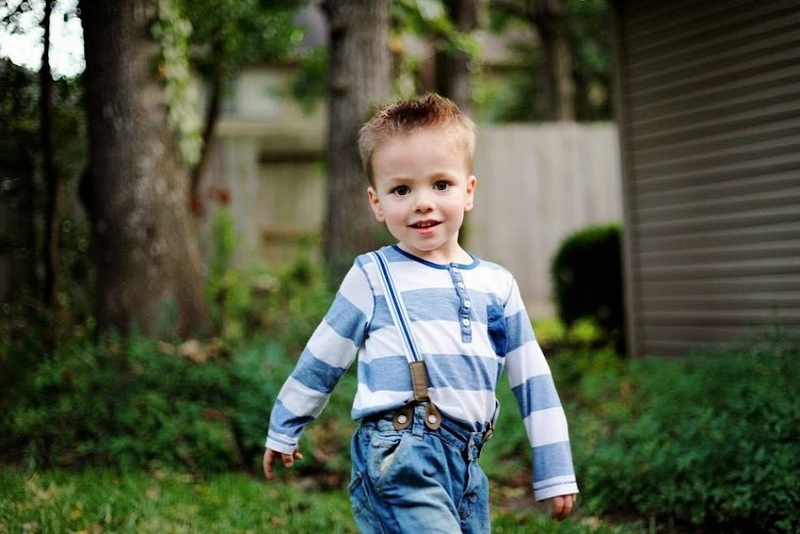 The CDC just announced an almost 15% increase in the prevalence of autism at 1 in 59 kids. With a staggering number like that it’s likely that you know someone affected by ASD. As churches grow and seek to increase the kingdom of God, hopefully that will mean your church’s special needs population will grow as well. I currently attend a small church plan in New Caney, TX and right now we do not have a special needs ministry as there is not a need yet. However, one day there will be, God willing, and I know that our church family will welcome these individuals with open arms. Your church may already have a special needs ministry and especially because the need will likely grow, I want to encourage you to serve those with special needs. Working with individuals with special needs can be challenging to say the least. To say anything else just simply wouldn’t be true. One of my son’s therapist once told me that she could only work part-time because the job was so emotionally demanding of her. She’s very passionate about working with individuals on the autism spectrum and has a very upbeat personality. But being “on” all the time is hard. I don’t know about the demands of all special needs and disabilities, but I know with autism there are times of extreme joy and then times where things aren’t so great. There are intense lows and with communication barriers, those lows are hard to navigate. So why, knowing this, would anyone willingly offer to volunteer in a special needs ministry if they don’t have friends or family affected by disability? Jesus is describing the type of loving kindness that truly requires nothing in return. Serving individuals with special needs may not bring instant gratification. You may not get to hear about the children you serve turning their life over to Lord or singing praise songs just like other kids. Serving individuals that may not be able to care for themselves in even the simplest ways may not be the most admired or prestigious form of service and you may not see the fruit of your efforts immediately, but I believe that this form of service is an essential part of being the hands and feet of Christ. Believers are to demonstrate this radical love for people with disabilities and the poor and to any of those that cannot repay them because Jesus shows us that self-denying and self-sacrificial service is God honoring. Jesus says that those are the times you will store blessings in Heaven. Matthew 25:40 says, 'Truly, I say to you, as you did it to one of the least of these my brothers, you did it to me'. Remember as you share the Gospel with the child that can’t sit still, or a child that is flapping and swaying, that you are loving them as you would Jesus. It may be more difficult to serve in an area that can be challenging physically and emotionally, but its in those times that you serve when it is messy and ugly and hard that you will be blessed. Typically, special needs families are coming in to a church longing for a sense of welcome and belonging. They want a place that they can worship and feel that their children are safe and not a burden. I urge you to see and serve these families as though you are viewing them through the lens of Christ and not man. While the world says they are less-than or second rate, the Lord, in His sovereignty, has created them in His image and exactly how he wanted them. I love when the Lord speaks to Moses and says in Exodus 4:11, "Who has made man's mouth? Who makes him mute, or deaf, or seeing, or blind? Is it not I, the Lord?" WOW. God has a plan for each and every member of the body. He has a special plan for His people, both you and I and the individuals with special needs in our church body. If you are looking for a meaningful way to serve the Lord, won’t you consider helping in the special needs ministry? “12 For just as the body is one and has many members, and all the members of the body, though many, are one body, so it is with Christ.13 For in one Spirit we were all baptized into one body—Jews or Greeks, slaves or free—and all were made to drink of one Spirit. 14 For the body does not consist of one member but of many. 15 If the foot should say, “Because I am not a hand, I do not belong to the body,” that would not make it any less a part of the body. 16 And if the ear should say, “Because I am not an eye, I do not belong to the body,” that would not make it any less a part of the body. 17 If the whole body were an eye, where would be the sense of hearing? If the whole body were an ear, where would be the sense of smell? 18 But as it is, God arranged the members in the body, each one of them, as he chose. 19 If all were a single member, where would the body be? 20 As it is, there are many parts,yet one body. My husband and I are very blessed to be a part of a church plant in New Caney, Texas. We came from a church in Atascocita with a faithful Pastor who had a vision to start planting autonomous churches within the greater Houston area. That church had many missions minded ministries, one of which included the special needs ministry that my son was able to be a part of. My youngest of three children, Jacob, has severe autism. He is almost 8 and has minimal speech, elopes from safety, and cannot attend to a Bible Study for 20 minutes. 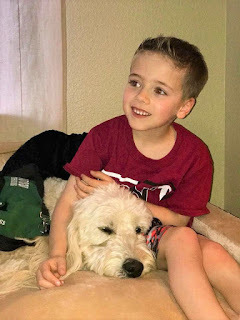 Having a buddy system to help him behaviorally and to keep him safe as well as having curriculum adjusted to his needs was an enormous help to us. So, when we stepped out in faith to follow a preacher that we didn’t know to a church plant that didn’t have a special needs ministry yet or enough volunteers for it, I was a little nervous for Jacob. Nevertheless, we felt like the Lord wanted us to go, so we followed with eager anticipation to see the Gospel spread through our new Pastor and church. Being a special needs parent can be pretty isolating at times. We can’t go to peoples’ homes and attend events very often because of how much anxiety it causes my son. Even standing in the lobby visiting with people can be hard when my son is trying to dart away. However, when it came time for our church to start hosting Bible Studies in homes, our Pastor urged us to host one in our home. This has been a spring of so much encouragement for us. People come to our home every week and worship God and fellowship despite my son’s frequent interruptions of song and humming. They laugh if he runs through the room full speed or when he takes a swig of their water or climbs in someone’s lap that he barely knows. They don’t mind the sounds of every object in the house spinning in the background. They even understand that we have to deadbolt them in our house with a key to prevent him from wandering outside. These people coming into our home and seeing our wild and unusual life and still being joyful and present is so encouraging. We feel connected in a deep and meaningful way. Being a part of a small group has grown our faith tremendously as we pray for others and as they pray for us. There have been times of profound sadness and stress when all I could do was cry and ask for prayer and they all stopped and prayed over us. There have been moments of joy and triumph that we got to celebrate with them and those friendships have strengthened. What I’ve seen time and time again is that God is faithful. He has provided encouragement for us in a way that we weren’t expecting, and we are so thankful for His provision. God is so good. We are so thankful. I pray you find this type of encouragement in your local church. People who love the Lord with all their heart will love and accept your family no matter how different. I pray you find believers that can strengthen your faith and that you can serve alongside. · Encourage them to join a small group or bible study and to share their hardships and victories. Pray for them and celebrate with them. · If their child cannot be in the Worship Center, create a buddy system where people take turns caring for their child in Bible Study, so they can be free to worship. · Show excitement rather than dismay when their child arrives at church, especially if their child is engaging in behavior that seems odd or different. · Look at their child in the eyes and say hello. You may be surprised at how many people turn away instead of looking at individuals with special needs. 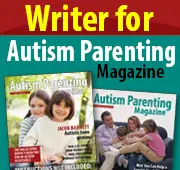 · Encourage your children to engage with special needs children. I promise it will bless them and grow them. · Go to them if you see them isolating themselves. I find myself sitting alone with Jacob when he is having a hard day because I don’t want to disturb people. · Ask them how you can pray for them and then PRAY. 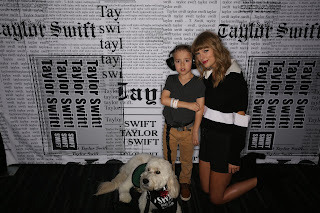 Taylor Swift donated $10,000 towards Jacobs service dog!